Camera phone can only overcome the shortcomings of myopia is not a distance, so that a clear vision as presented in your eyes. This product, avoid the picture distortion, super wide-angle, through light volume, high resolution, color reproduction is good, the phone image quality has improved significantly. For the telescope lens , do keep it dry as its sealed-in unit structure, put the telescope together with the dryer which enclosed in the box. It can take a picture while fixing the telescope on back shell. 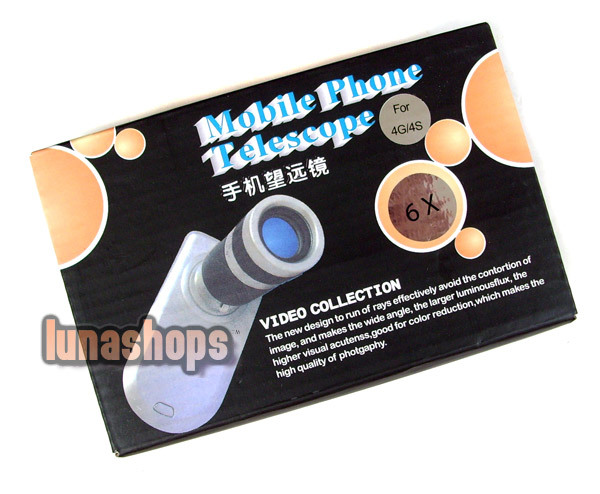 Change the cellphone back shell/crystal housing first enclosed with the telescope. Turn the small hack triangle to the left side, this is the shortest distance the telescope can over(the distance is usually within 5 meters).